Storm water runoff is a major problem for our bayous (especially those that have had protective trees and plants stripped from their banks). And impervious surface is the major cause of flooding and contributes to water pollution too. Instead of soaking into the ground (or being deflected by trees and leaves), filtering naturally and slowly through the soil and being cleansed of pollutants, storm water runoff gathers quickly, racing through toxic streets and highways, into drainage systems and pouring all at once into our bayous and creeks. Here is an interesting and timely article in the Houston Chronicle by the founder of Houston-based TrueGrid, a permeable paving company that even creates permeable grass parking lots. There is, in fact, also a permeable asphalt, recommended by the Environmental Protection Agency (EPA). But here’s another interesting fact: in a typical urban residential area, rooftops account for 30-40 percent of the total impervious area. What can you do about that? Individuals can do a lot! The Houston Arboretum has programs about how to build rain barrels and rain gardens. And here is an EPA slideshow about the importance of rain gardens and how to build them. We don’t need to keep flooding and destroying our bayous, making them into bigger, uglier drainage ditches. After the rains started coming down on Memorial Day weekend, geologist Bill Heins, an ardent opponent of the Memorial Park Demonstration Project, couldn’t stop thinking about what was happening as the waterway continued to swell and slop over its usual banks along the last natural stretch of Buffalo Bayou that exists in Houston. The flood waters haven’t fully receded yet, but both those in favor of the project and those against it have been out on the bayou looking for anything to back up their arguments. 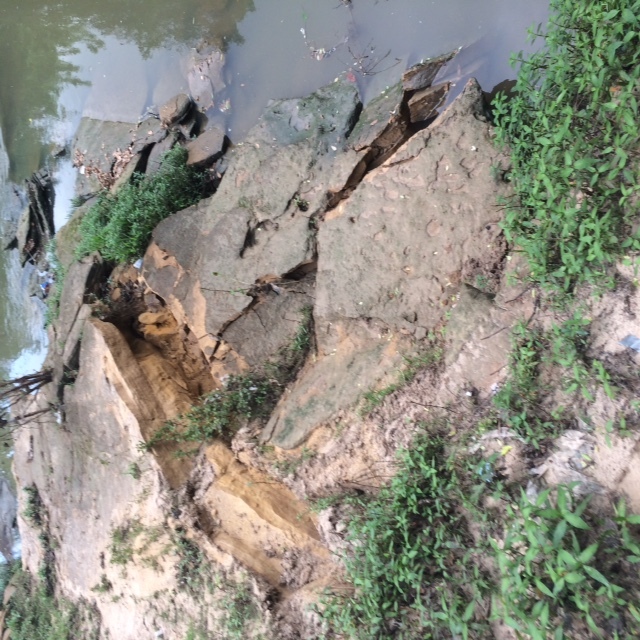 Project proponents point to signs of erosion on the soggy banks as evidence that we need this project. Those against it, including Heins, argue that the banks are showing signs of only minor erosion and that the evidence so far shows the natural system of the bayou — even during a record-setting flood — is working perfectly, meaning the Memorial Park Demonstration Project is unnecessary. Read the rest of this article in the Houston Press. Updated June 8, 2015. See below. Updated June 7, 2015. See below. The Harris County Flood Control District is planning to create a 12-foot wide pathway for maintenance vehicles along the graded bank of Buffalo Bayou in Memorial Park. The maintenance road parallel to the bayou is not included in the plans to “restore” the wild banks of the bayou submitted to the Army Corps of Engineers by the flood control district. The district revealed the plan for what it is calling a “Monitoring Access Zone” at an invitation-only meeting Tuesday, June 2, 2015. The meeting was one of a series to develop a planting plan for the $6 million “erosion control,” “bank restoration,” “water quality improvement,” “flood conveyance” project known as the Memorial Park Demonstration Project. Apparently the planting plan is not progressing well, as at the meeting the district proposed planting tall fescue, an invasive exotic almost impossible to control. Tall fescue has been the scourge of Texas prairies for several decades at least. “Tall fescue forms a near-monoculture and is responsible for the loss of otherwise undisturbed prairie remnants throughout Texas and the Midwest,” reports one of our landscape ecologists. Well, so much for the district’s native plant expertise and commitment to a native-only riparian forest. This beautiful tributary extending deep into the center of Memorial Park is labelled a “gully” by the flood control district. It will be plugged. Photo by Jim Olive on March 25, 2015. Little is known about the previously undisclosed but long-suspected “Monitoring Access Zone.” According to a source who was at the meeting, the 12-foot wide pathway will be planted with some sort of seed mix for several years until the district is certain the “restored” banks will hold. They won’t hold, of course, so this grassy, flat “access zone” is likely to be permanent. The district explained at the meeting that it was not required to reveal the “monitoring” road to the Army Corps of Engineers because it does not impact federal waters, presumably because the road will be above the Ordinary High Mark, which is the lateral limit of federal jurisdiction. So far we don’t know the length of “Monitoring Access Zone,” whether it extends along the entire north bank of the project area, including private property, or whether a “Monitoring Access Zone” will also be built on the south bank of the project, land which belongs to the River Oaks Country Club. Guess we’ll have to ask the flood control district. And object to the Corps. What else is the flood control district not telling us? Snowy egrets flying past another tributary adjacent to the middle meander in Memorial Park, also labeled a gully by HCFCD. The banks here will be bulldozed, and the bayou filled in and a new channel cut further south through River Oaks Country Club property. Photo by Jim Olive. There is no “road” planned for maintenance vehicles on the wild banks of Buffalo Bayou targeted for “restoration” by the Harris County Flood Control District. Participants in the district’s Vegetation Advisory Workgroup for the dredging and channelizing project had been told that for several years after “restoration” there would be a grassy 12-foot wide “Monitoring Access Zone” for maintenance vehicles to access the bulldozed and reconstructed banks of what is now a perfectly healthy historic natural area in need of no monitoring or maintenance whatsoever–other than picking up the trash and mitigating runoff from trails and parking lots. This “Monitoring Access Zone,” workgroup participants were told, would remain in place until there was no longer any need for monitoring, replanting, watering, removal of noxious invasive vegetation, or repairs to failing “stabilized” banks, etc. Presumably removal of noxious invasive vegetation would not include the tall fescue, a noxious invasive plant, described above, that the district earlier this month was contemplating planting. Responding to objections, the district reportedly has changed its mind about the tall fescue. Krahn said that monitoring activities would take place on both the north and south banks of the bayou in the project area, which includes Memorial Park and the Hogg Bird Sanctuary on the north and the River Oaks Country Club on the south. He also wrote that “no work zones” on the bayou were in fact “no work zones,” despite the fact that heavy equipment would be driven over the banks, according to the district’s plans. However, above the Ordinary High Water Mark these “no work zones” would not be graded into bankfull benches, wrote Krahn, because “these are portions of the project area that already have the necessary geomorphic characteristics for a sustainable, stable channel.” A bankfull bench is a flat or sloping area above the bank of a stream that slows overflowing floodwater. Asked to clarify the “Monitoring Access Zone,” Krahn has not yet replied. 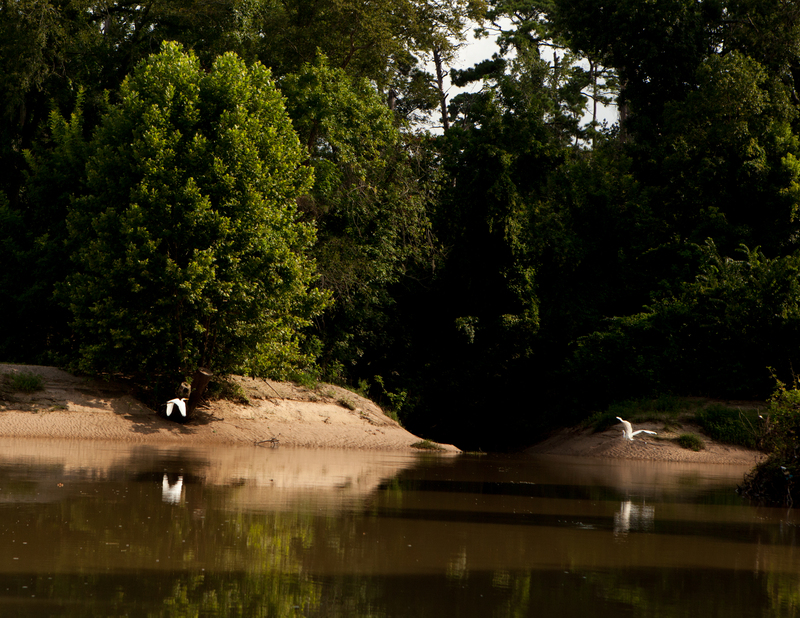 “Revised” plan to destroy Buffalo Bayou not really “revised” at all. Project manager says no significant changes to much criticized original plan. No sandstone in project area, says flood control, contradicting itself. Invisible ancient sandstone in project area at 29°45’35.8″N 95°25’58.6″W. Photo by Bill Heins. 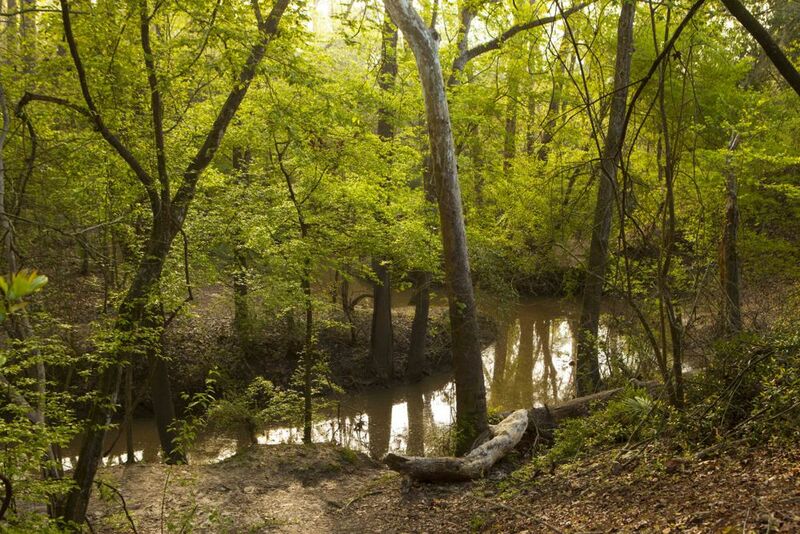 Despite the hundreds of comments criticizing the purpose, methods, impact, cost, benefit, and harm of Harris County Flood Control District’s proposed “erosion control” project on Buffalo Bayou in and around Memorial Park, the district has made no significant changes to the plans recently re-submitted to the Army Corps of Engineers. Jason Krahn, project manager for the controversial Memorial Park Demonstration Project, told Dianna Wray of the Houston Press that the district was “simply following the guidelines” and that there were “no significant changes” to the original project plan. Indeed, many of the “revised” plan sheets posted by the Army Corps of Engineers on its website appear to have been simply relabeled with new dates, though there are some with new details. The public has until June 5 to send comments to the Corps about the district’s “revised” permit application and the district’s responses to previous comments. There is no limit on the number of comments one can make. So if you’ve already made a comment, make another!